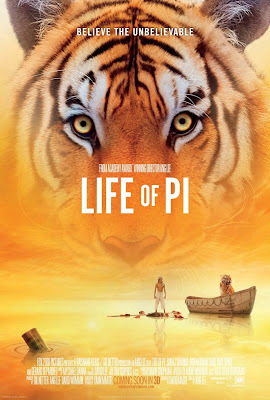 I've never been to see a film before in the hope that it would be completely and utterly average, but I did for Life of Pi, just for the sake of the cheap gag of giving the film 3.14 out of 5. Unfortunately for me however, the film was simply wonderful! 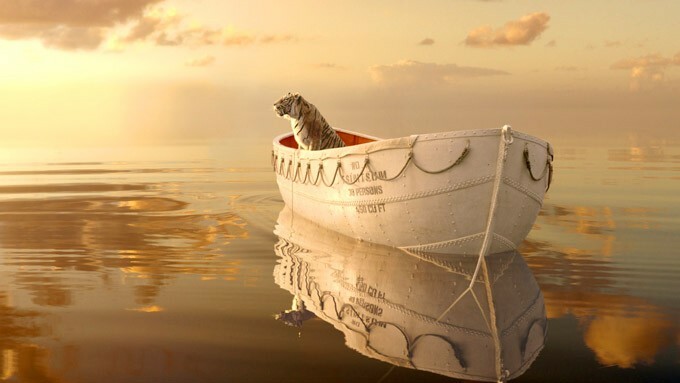 Life of Pi: That film with the tiger in a boat! Undoubtedly you will be aware of Life of Pi as to say that the marketing campaign for it has been extensive would be an understatement - the film is everywhere! Adverts have been playing on TV for weeks, just about every film for the last half of the year has had the trailer attached to it, most of the buses driving around the country are plasters with posters, and even the film itself starts with a small advert telling the audience to spread the word after experiencing what they defined as 'the phenomenon' via facebook and #lifeofpi! The marketing truly has been remarkable for this film, and it's easy to understand why; two words - 'The Hobbit.' With such a big franchise film released just one week earlier, a film like this is easy to miss; but quite frankly it really shouldn't be. One of the quotes that you will have probably seen written everywhere on all of the advertising calls the film 'the next Avatar,' and it's not difficult to see why. The visual effect are nothing short of breathtakingly beautiful, with a lot of the film implementing a largely CGI environment flawlessly. One problem that I often find with films that depend on the use of CGI too heavily is that I can become very aware that it is in fact just a load of computer graphics as the technology tends to age quickly and stick out like a sore thumb, losing a sense of attachment and taking me out of the film as it reminds me that I am watching just that - a film. This is often a very big off-put for me, yet the CGI used in Life of Pi, bar a few animals that did look like computer animations, was flawless. The almost fantasy-like world created by the special effects team is nothing short of breathtaking, and a well deserved pat on the back is certainly in order. But it's not all about impressive CGI effects - who really goes to a film for that!? The effects in Life of Pi are so beautiful however that they actually made me more engaged within the world of the film. Particular shots are so incredibly beautiful that they created a strong emotional response just looking at them. The film is like a piece of art work; not an art film, it's still very much a mainstream piece, but it really is breathtaking to look at - and although it hasn't been released in IMAX, this would have been the perfect film for it. One of my favourite shots from the beautiful film: Life of Pi. But perhaps more importantly, let us not forget the tiger! As Pi and the comically named tiger (I shan't spoil the gag for those who don't know) are essentially the two leading characters, it is important that the tiger is created well with the CGI (for obvious reasons using a real tiger was out of the question) so that the audience can experience an emotional response to the relationship and peril that the film explores. 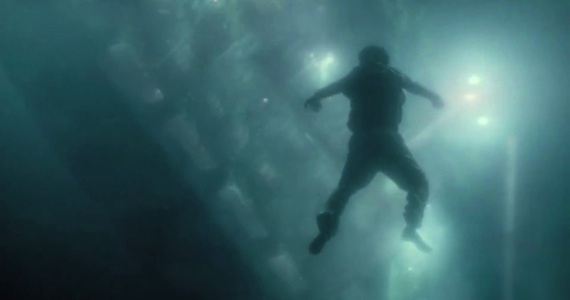 What comes as a result is perhaps the most convincing piece of CGI that I have ever seen in film. The tiger is brought to life so well, that I actually forgot that it was CGI, and although I knew that it obviously was, I even at times had to question whether or not they actually used a real tiger. If the film wins anything this awards season, it'll certainly be for these technical achievements. The story itself is like a spiritual version of Cast Away on a life boat with a tiger! That may not be what they'll print on the posters, but who doesn't want to see that film!? Pi's story is extraordinary - the film is engaging, captivating, magical and moving - it's nothing short of wonderful. It isn't based on any true events, but a big theme of the film asks the question of just how much can you believe, and what you should believe, bringing in big ideas, themes and questions about spirituality and religion. Life of Pi is very much at its heart a spiritual coming of age tale about a boy, confused by the many different religions and their multiple ideas and teachings, becoming a man and finding the answers that he is searching for. Perhaps that isn't your thing, and if it isn't then you still have a tiger in a boat, but for those who care to look a little deeper, the film will give you a fair bit to think about. This is where it suddenly loses the 'next Avatar' title, by becoming something far greater than just pretty special effects. Pi (Suraj Sharma) has a spiritual search for his maker in Life of Pi. The effects are extraordinary, the story is captivating, and the film is well paced and at a good length (it's not too short, it's not too long, it ends exactly when it needs to), but I do have one nagging problem with the film in amongst all of this praise. Life of Pi has been released in 3D (as I'm sure will come as no shock to you), with the advertisements for it putting a lot of emphasis on that fact to make you go and see it for a higher premium (hence 'the next Avatar' quote). However I chose to see it in 2D in order to appreciate the great attention to detail and vivid colour that the film clearly boasts but would lose a lot of behind a pair of 3D glasses. As I was happily watching the film, mid way through the aspect ratio suddenly changed from filling the entire screen to wide-screen letterbox for one particular sequence, then again later to an even smaller size from another shot. Whilst Ang Lee replied in an interview on NashvilleScene.com that he chose to do this because "I've always wanted to do that... since film school, and no one allowed me to," I just feel that it is a bad move (although fair play to the guy for giving it a shot). What it does, perhaps even more so for 2D audiences, is to take you out of the film. The sudden change of the aspect ratio makes you question whether perhaps something has gone wrong with the projector as it's so abnormal and sudden, thereby reminding you that it's only a film and taking you out of the moment as a result. It's nothing more than a cheap 3D gimmick (in this case to make something look like it is jumping out of the screen), and personally I couldn't care less about it - hence watching the film in 2D. No-one else does Mr. Lee, and perhaps for good reason too; why bring an imperfection to such a wonderful film? 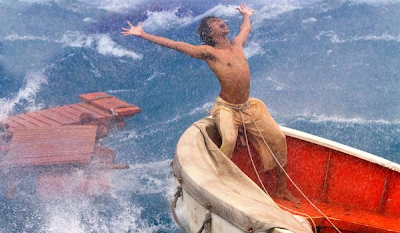 Ang Lee's beautiful adventure Life of Pi is a true spectacle of cinema. It will make you laugh, smile, jump, think, and maybe even cry a little as you watch a stunningly visual piece of modern cinema. Call it 'the next Avatar' if you will, but the film brings a lot more depth than that, and I'm not talking about the cheap 3D gimmicks that slightly dampen what is otherwise a fantastic piece. I'm not sure if it has what it takes to bag the best picture awards come awards season, but of the films released in the build up to it, Life of Pi certainly has a fair shot - but regardless, it's a wonderful family film and my pick of the Christmas Holiday releases this year. Life of Pi (certificate PG) is now showing in cinemas across the UK. Have you seen Life of Pi? Agree or disagree with my review? Leave your thoughts and opinions in the comments section below!